Beat cream cheese and powdered sugar in large bowl with electric mixer on medium speed until smooth. Beat in rum on low speed; set aside. Beat whipping cream in chilled small bowl on high speed until stiff peaks form. Fold into cream cheese mixture. Split ladyfingers horizontally in half. Arrange half of the ladyfingers, cut sides up, on bottom of ungreased square pan, 8x8x2 inches, or round pan, 9x1 1/2 inches. Drizzle 1/4 cup of the espresso over ladyfingers. Spread half of the cream cheese mixture over ladyfingers. Arrange remaining ladyfingers, cut sides up, on cream cheese mixture. Drizzle with remaining 1/4 cup espresso. Spread with remaining cream cheese mixture. Sift or sprinkle cocoa over top. Cover and refrigerate about 4 hours or until filling is firm. Store covered in refrigerator. For 9 grams of fat and 170 calories per serving, substitute reduced-fat cream cheese (Neufchâtel) for the regular cream cheese. Substitute 2 cups frozen (thawed) reduced-fat whipped topping for the beaten whipping cream. 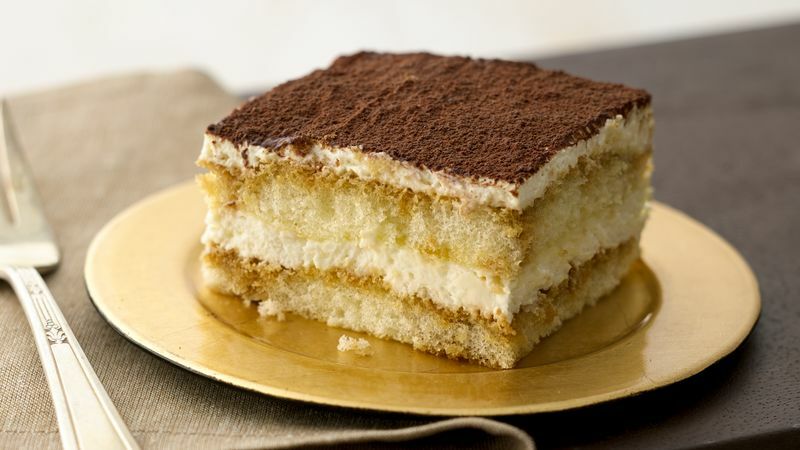 “Carry me up” is the translation for tiramisu, pronounced tir-ruh-mee-SOO. This rich Italian dessert is usually made with mascarpone, a buttery rich, slightly sweet and smooth Italian cream cheese. Look for mascarpone in the cheese case in large supermarkets, specialty cheese shops or gourmet food stores.